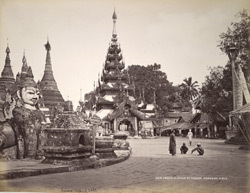 Photograph of the Shwe Dagon Pagoda platform, Rangoon (Yangon), Burma (Myanmar), taken by Bourne & Shepherd in the 1870s. The Shwe Dagon Pagoda is Burma's most sacred Buddhist shrine, and stands at the centre of a temple complex on Singuttara Hill. This is a view of the wide ambulatory platform encircling the pagoda. In the left foreground can be seen a manuthiha or sphinx, a guardian figure which has a double lion body with the face of a man. The gilded central stupa is surrounded by sixty-four smaller stupas, and several of these satellite shrines can be seen behind the sphinx. Some of the many sacred and administrative buildings, monuments and sculptures built on the temple platform can be seen in the distance, including a pavilion or tazaung with a traditional tiered roof known as a pyat-that.